I’ve already waxed poetic about my favourite city, Edinburgh. How that brooding city with so much history etched across its cityscape reminds me of a moody gentleman (like my favourite actor). Moody and mysterious whenever dark clouds hang over the city for days. And when the sun pops out, it warms you like his smile, making you feel like you’re the most beautiful and important person in the world. But you see, my obsession with Scotland goes way back. Back to my college years and rugby playing days while in the US. The first international university I ever applied to for my post graduate studies was the University of Edinburgh. I was going to get a Masters in Geographic Information Systems (GIS). Edinburgh my crush would be my entry into this country that had fascinated me for so long. Like your best friend’s rugged older brother who seems way out of your reach as he storms around the house in a temperamental yet alluring funk. While I ended up sticking closer to home for my Masters, my fascination with Scotland only developed roots. I call it Scotland playing hard to get. I would visit later on but still, it was never more than a couple days here and there. So when I had the opportunity to head back to Scotland to speak at and attend the Social Travel Summit, this time around to Inverness which is the gateway to the Scottish Highlands, saying no would have felt unnatural to me. Another opportunity to get close and into my crush country. And as I knew would happen yet again, I was only there for a couple of days, keeping Scotland within arm’s length yet letting it remain such a tease. But in those few days, I packed in so many memorable experiences below. Within an hour of arriving into Inverness, I joined a bunch of colleagues within the travel industry in town for STS Inverness on a scenic tour around the region, hitting Dores Beach at the shores of the infamous Loch Ness and sweeping panoramic views of the Highlands from Suidhe Viewpoint. Loch Ness is home to the legend of Nessie – a large dinosaur-like creature with the first recorded sighting over 1,500 years ago. Needless to say, stories of Nessie sightings have ruled the media even as recently as September 2016. We also visited the impressive 140ft high Falls of Foyers, a dramatic waterfall set within a deep gorge which runs into Loch Ness with multiple switchbacks of hiking to get down to it and back up. But it was at Suidhe Viewpoint that I fully realized Scotland’s rugged charm. My previous trips had only been to Edinburgh and its surroundings but seeing this small glimpse was enough to convince me of yet another trip to specifically explore and experience this region of the country. Not that I needed much convincing in the first place. And then there are moments that stay with you for the rest of your life. Filed away in your mind and heart within easy reach to those feel-good memories. It was our gala night at the fairytale-like Achnagairn Castle which was built in 1812 and lies about seven miles from Inverness. We were welcomed by traditional Scottish bagpipers, followed by the traditional Address to the Haggis performed by Willie Cameron, which is a recitation of the poem by 18th century Scottish Poet Robert Burns, and delicious locally-sourced Scottish lamb for dinner. We listened to stories of the legendary kelpie, which is some sort of mythical water horse, told by local storyteller Tim Porteus. The kelpie is said to haunt many of the country’s lochs and rivers and it appears to people as a beautiful horse or pony. It lures people to take a ride on it and then it takes them away, down into the depths of the lake. A Kilt fashion show by Siobhan Mackenzie which kept the energy going all night followed by dancing the Ceilidh – a traditional Scottish line dance – with the band Bahookie which had us skipping and twirling along with our partners. That night offered up various tastes of Scottish tradition and culture in bite-sized samples. 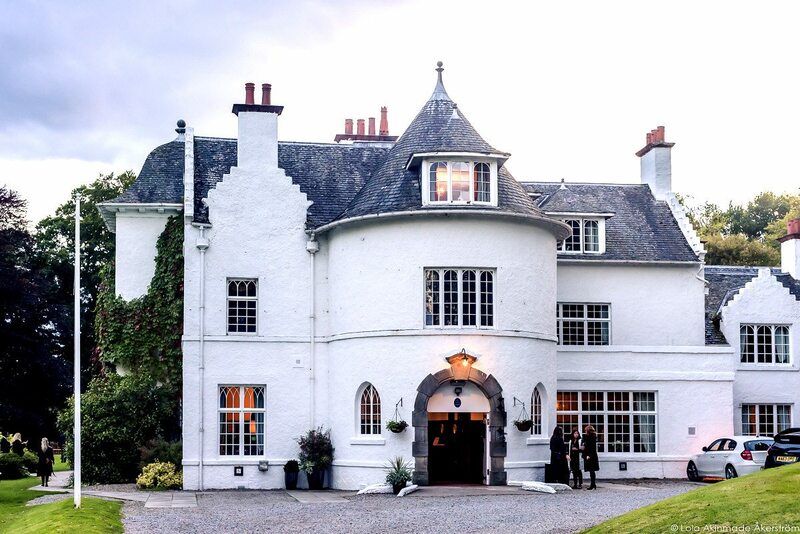 Considering I absolutely love exploring culture through tradition, food, and lifestyle (my tagline above), I thoroughly enjoyed my night at Achnagairn Castle and obviously plan on returning to Scotland to explore more of its local gastronomy and folk traditions and storytelling in depth. I’ve visited Scotland three times now, and each time has been such a tease. A small glimpse into its persona. Not long enough to fully form unbiased opinions but long enough to know that there’s some undercurrent about Scotland that draws me in. Pulls me in. The way you feel within close proximity of someone you have a mad crush on. There are some places with deep history and hauntings that easily spook me out. But not Scotland. Even though it’s one of the most haunted countries on earth. I can’t quite place my finger on it. Maybe I was a Scottish fisherman’s wife long ago in another time and space (if I believed in past lives). Who knows. There’s a basal acknowledgement of one’s humanity here in Scotland. A grounding that keeps you firmly rooted to values and family and friendships and laughter and other more important things in life that connect us as humans first. Some call it the Scot Spirit. That feeling I get whenever I’m on its shores is one I absolutely love and comfortably slip into. And like a crush, I don’t want to unravel them completely and know every single detail about them. I want to keep that feeling of mystery and allure that continually keeps me hooked and craving their proximity. View more photos from Scotland in my image bank below. Special thanks to Visit Britain who were the main sponsors of the Social Travel Summit (#STSInverness) for the experience as well as organizers, iambassador. As always, full editorial control and opinions are mine.